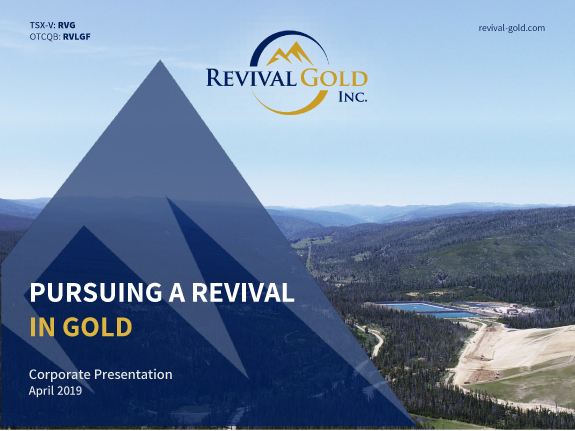 Following in the Footsteps of Idaho’s First Governor - Revival Gold Inc.
Toronto, ON – October 2nd, 2018 – Revival Gold Inc. (TSXV: RVG, OTCQB: RVLGF) (“Revival Gold” or the “Company”), a growth-focused gold exploration and development company, announces that drilling has commenced on the Haidee patented claim (“Haidee”) within Revival Gold’s Arnett Gold Project (“Arnett”) located in Lemhi County, Idaho. “We are thrilled to be following in the footsteps of Idaho’s first Governor”, said Hugh Agro, President & CEO. “Gold was first discovered in eastern Idaho in the 1860’s at Beartrack-Arnett. With a third drill turning at Beartrack-Arnett we have embraced the spirit of Idaho’s earliest frontiersman and marked another exploration milestone for the benefit of our shareholders, Lemhi County and the State of Idaho”. implementation of National Instrument 43-101. Accordingly, the PAH 1994 Update does not constitute a mineral resource, or a mineral reserve as defined by National Instrument 43-101. The Project will require considerable further evaluation to verify the PAH 1994 Update. As of the date of this news release, a qualified person has not done sufficient work to classify the historical estimate as current mineral resources or mineral reserves and the Company is not treating the historical estimate as a current mineral resource or mineral reserve.